It’s a lot of work to make an end table, but it’s been a boring week. John Irons moves with his girlfriend to Jersey City to design medical equipment for the hospital she works at, run by Dr. Villain (it’s French, should be pronounced “Will-hane”). He’s also been exposed as Steel and has a new armor, but loses his hammer stopping a criminal. Natasha meets a boy named Paul that she decides to call Boris and he still asks her out. Steel also meets a woman named Margot who “runs the downtown squads” and claims to be part of his new “supporting cast”. What they got right: Admittedly this is a good jumping on point. It’s why I jumped on here. I do like Steel’s new armor design and his own symbol (Superman suggests he create his own). 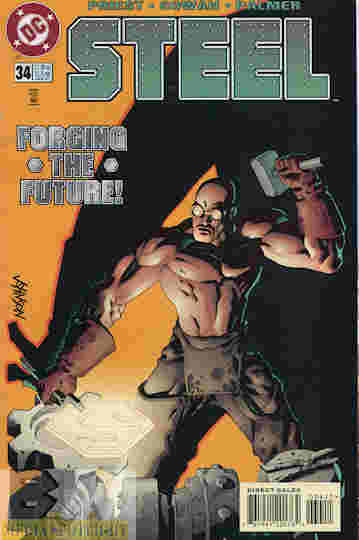 The art is quite good and the credits boast about using computer coloring, which was still relatively new in 1996, when the comic was made. Now some dope with his own storytelling analysis blog does a weekly comic strip all on computer and has used computer color for years. What they got wrong: It’s how the story changed that I’m not a fan of. The new supporting cast is rather annoying, Natasha is a brat (although she might have been), and the old supporting cast either died or ran off on Steel. Plus I don’t like the fact that his secret identity is destroyed and his armor is now weaker just so he can wear it under his clothes. I don’t even see the point of that since he’s not hiding his identity. Also the “Will-hane” thing is a running gag in Priest’s run and it just doesn’t work in print. It’s just an excuse to lampshade he’s basically Steel’s version of Dr. Alva from Milestone’s armored hero, Hardware. Margot’s introduction is about as subtle as a flying sledgehammer, Paul/Boris is rather boring, and Priest runs off the kids Steel made friends with. It’s like he’s doing a whole new series. Finally, the “introduction” of Jersey City is rather comedic and harsh. Everybody has guns and wants to shoot them at someone, the guy coming for his stolen cab sees the man bleeding and automatically assumes he has AIDS, later some guy threatens John and goes on about being held down by da man…is Amanda and this job really worth all this? It will get worse from here. Recommendation: Look, I’m sure someone really enjoyed Priest’s attempt to save the series from cancellation and that’s fine. SOME ideas here and coming up I can get behind, but there’s so much of it that feels like he’s just doing a completely different series from the few issues I have picked up. I’m keeping this issue to remind me what I didn’t like and there may be some other issues but most of what I have from this point I’m just not interested in holding onto and I’ll explain why in future reviews. If you like what you hear from the reviews you might enjoy this run. Posted by ShadowWing Tronix on April 9, 2018 in DC Spotlight, Yesterday's Comics and tagged Christopher Priest, DC Comics, DC Universe, Natasha Irons, Steel (John Henry Irons).